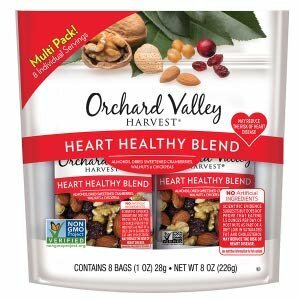 Amazon.com offers the Orchard Valley Harvest Heart Healthy Blend Multi Pack, Non-GMO Project Verified, No Artificial Ingredients, 8 ounces $5.98. Add-on item ships with any qualifying order over $25. Features: Some of the best recipes are those passed down from one generation to the next. From the very start, there was something so right about them. So simple. So delicious. At Orchard Valley Harvest, that’s how we feel about our nuts, dried fruits, and mixes. Long before we were around, nature came up with the perfect recipe-one that didn’t include artificial ingredients or genetically modified organisms. We stay true to that recipe.